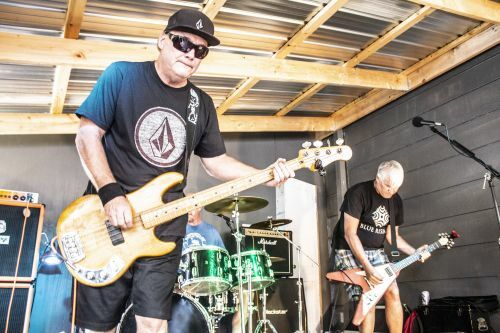 After a long hiatus members of Teenage Lobotomy reunited for the first time in 22 years at Center Fest in Robinson North Dakota this summer. With influences such as Husker Du and the Circle Jerks their high energy immediately had the crowd’s attention. Now they’re bringing that sound and energy to the Sidestreet this Friday. We had a chance to catch up with guitarist Jim Kennedy on the history and the future of the band. High Plains Reader: How Long since Teenage Lobotomy last played? Jim Kennedy: The band played together from 1983-1986. We did a reunion show at Kirby’s in fall 1996. So, it’s been 22 years since we last played. HPR: What was it like not playing for 22 years? JK: All three of us have been involved in many other music projects over the years. It was amazing how fast the old songs came together. Of course, the tempo is a little slower than 1986, but not much. HPR: You’re in Indiana and the other band members are in Minneapolis, how did you manage to practice? JK: We rented practice space in the Roosmor Building in downtown St. Paul. I traveled from Bloomington, Indiana for several long weekends starting in April. Our goal was to practice but also spend time together, especially at the brew pubs. And we had support from our significant others to spend time away from home rehearsing. HPR: What is Teenage Lobotomy’s origin story? How did you all get together? JK: We met at NDSU. I came from St. Paul. Ben Eggan (Bass) is from Los Angeles and Mike Johnson (Drums) is from Williston, ND. We played a basement tour to start. Mostly our own music. Then we decided to find a bar in Moorhead to play (where the drinking age was 19 compared to 21 for Fargo). We talked to Mr. Kuklenski (Kirby) and agreed to let us play if he didn’t have to pay us, and we brought our own PA. Back in 1984, Kirby’s had a small stage in the corner of the main room and was booking cover bands on weekends. After a few shows with good crowds, Kirby realized he had the perfect bar and location for live music. He eventually put in a new stage and a house PA and lights. He let us play a weekend show every four to six weeks. It seemed like we spent most of our college days there. Eventually, we worked to get other local bands to play with us at Kirby’s. At the same time, we started warming up for the Phones, Suburbs, Limited Warranty, and many other Minneapolis bands at Kirby’s and music venues in other cities. The band played music festivals at NDSU and UND. The band eventually made its way to playing shows in Minneapolis. HPR: You will be playing during NDSU Homecoming week. You’re NDSU guys, what’s your connection to ATO? JK: All three of us were members of the ATO Fraternity and practiced in the furnace room of the house. Many Late-night jams occurred in the ATO Basement, especially when we first started playing. It’s where we started. We were fortunate to have many close friends that supported the band. HPR: What were your main influences in developing Teenage Lobotomy’s sound? JK: It was combination of all three members. I was into the Minneapolis sound including Husker Du and the Replacements. Ben was following the Blasters and Circle Jerks in Los Angeles. Mike was playing in a country band In Williston in high school but was into classic rock. All three of us loved the Ramones. These influences together formed the band. Early on, we spent many hours listening to the records we brought to college. These influences all had an impact when we starting writing our songs. We also decided early on to keep the band to three members with just guitar, bass, and drums. Mike’s speed on drums was a big factor in our early sound. HPR: You once opened for the Replacements? What was that like? JK: Yes, we warmed up for the Replacements at Kirby’s bar in May 1985. It was chaos. They cleared all the tables and chairs from inside and packed the place. The promoter also rented a massive PA that was way too big for the space. We hung out with the band before and after the show. Paul Westerberg was friendly, and Bob Stinson shared beers with us and talking about music. It was great to hang out with a band that had some much influence on our music careers. Our set went well. The Replacements show ended after one of their amps stopped working but their show was excellent. It was so loud, even on stage, my ears were ringing for a week after the show. HPR: After getting back in the saddle, does Teenage Lobotomy plan on keeping up the momentum and continue to play? JK: I believe all three of us would like to keep hanging out and playing music. But, this is it for now after the Homecoming show at Side Street Pub. Our next stop might be the studio. But, who knows? HPR: What is the biggest difference when you play now vs. when you played at Kirby’s? JK: When we were playing Kirby’s, we were young, inexperienced, and thought we would be playing music forever. Things have changed; we are a little wiser with many years behind us. At Center Fest, people were amazed that we could still play that loud and fast. But, the sound is much more refined now than in 1986. Plus, we realize now that doing Pete Townsend style jumps on stage can be hazardous to your health. It’s also odd because some of our kids are old enough to be in the crowd watching.